2018 first place team with sponsors and teachers. Left to right: Evan Westra (WestTool & Design, TSMA Board Member), Amy Johnson (Northern Contours, Sponsor) Syanne Jepson, Declan Young, Jasmine Sonmor (President, Aura Fabricators), Dennis Wutzke (STEM teacher), Mike Donaghue (STEM teacher), and Laura Roder (STEM teacher). Students are responsible for all aspects of each video project, including planning, scripting, shooting video footage, interviewing, and editing. First, Second, and Third place videos are selected by a judging panel. Winning teams receive cash for their school and students from winning teams also receive a cash award, with total cash awards of just over $4,500. 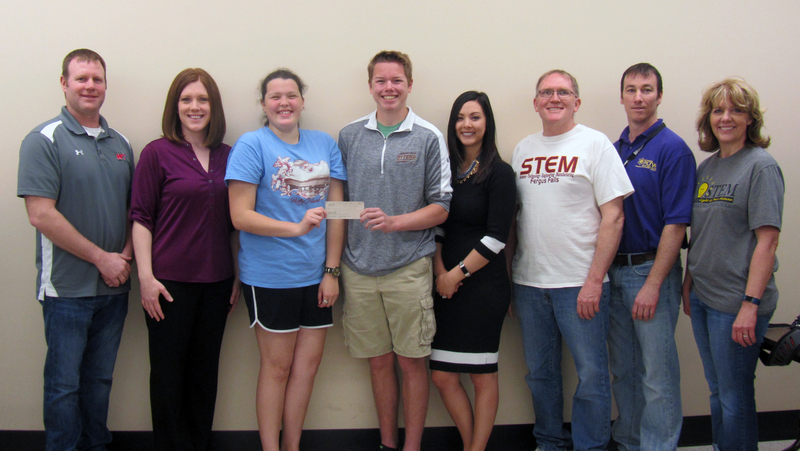 This year’s first place was awarded to Fergus Falls High School and the student team of Declan Young and Syanne Jepson. Because the school also received the People’s Choice Award, the combined cash award was $2,250. Each student recieved $150. The second place award went to Frazee-Vergas and the third place award went to Moorhead High School. Every year, we give the public the opportunity to vote for the video of their choice. The one which receives the most votes will win the People’s Choice award. The People’s Choice award winning team receives $750 for their school and $50 per student. Voting for this year’s contest is officially CLOSED. After watching all three videos, vote for your favorite by clicking on the circle to the left of the video. Then click on "Vote" at the bottom of the screen. Voting is open April 17-April 30, 2018. You can vote once every 24 hours. Results will be shared after voting closes.